A moment of deep peace during Anahata Yoga Retreat’s Yoga Nidra & Restorative Yoga Instructors Training. When you’re contemplating which Yoga Teacher Training is right for you, one of the best resources can be speaking to someone who has already done that training. Of course, it can be hard to track down former trainees, so we’ve done that hard work for you. In today’s world, there is a great need for restorative practices like Yoga Nidra and Restorative Yoga, so I was delighted to hear that Anahata Yoga Retreat is offering a Yoga Nidra and Restorative Yoga Instructors Training designed for yoga teachers, health and education professionals, or anybody interested in immersing themselves in yogic relaxation techniques. 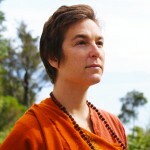 The training is led by Swami Karma Karuna, with help from several other well-trained teachers. Swami Karma Karuna teaches a comprehensive, authentic style of Yoga Nidra, developed over many years of study and many trips to India. Enhanced by Anahata’s quiet ashram setting high in the hills above Golden Bay, the benefits from the training are—as you’ll soon see—inspiring. We got in touch with Tracey, Tara and Meg—three women who recently participated in Anahata Yoga Retreat’s Yoga Nidra and Restorative Yoga Instructors Training—and asked about their experience of the training. As you’ll quickly see from their responses, all three were deeply impressed with the profound effects of the practices they were taught, and with the rigour and depth of the course and teachers. Why did you sign up for Anahata Yoga Retreat’s Yoga Nidra and Restorative Yoga Instructors Training? What made this training stand out? Tracey: I signed up for myself really. I had already experienced Yoga Nidra and wanted to embrace the practice and deepen my experience and understanding of it. I was in a state of personal transition, I thought it would be a great way to take stock, pause and use some of the tools to help with the new direction and transition in my life. Tara: I was originally drawn by the Yoga Nidra training component, as I wanted to be able to add that offering to the mindfulness training I provide for clients. I was also particularly interested in the rigour of the course design. I have a background in adult education and the combination of the 10 days training at Anahata, together with the very intensive post-training assignments and assessment period was very impressive and that was what clinched it for me. Meg: I signed up for Anahata Yoga Nidra and Restorative Yoga Instructor Training because of my passion for the practice of Yoga Nidra. I had some introductory experience of practicing and teaching Yoga Nidra at my home studio in Minneapolis from “slow flow” classes and wanted to have adequate training to teach this practice. I first practiced Yoga Nidra while I was a college student, and being quite stressed out, the practice gave me important space to deeply relax. When I was taught how to instruct YN after completing my 230-hour Vinyasa training, it barely scratched the surface. Back home in Minnesota, I began doing research on different schools that offered Yoga Nidra trainings, and Anahata’s course seemed like the best fit for me, which worked out wonderfully, as I decided to move to New Zealand for a working holiday! How did the content and practical experience of the training enhance your knowledge and experience of these techniques? Tracey: The course ran over 9 days and was a wonderful time of learning about relaxation, restorative yoga and breathing. I felt that the training method made sense; I had more awareness of why we had a certain order to the practices (as opposed to just learning the process). I felt physically the sense of release, and the effects of the subtle practices, which were powerful. Tara: I learnt an enormous amount, and really benefited from being trained and taught by people who are clearly experts in their field. The content covered, and the depth and breadth of the material provided was extremely helpful. 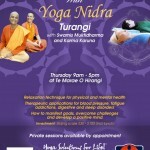 I truly had not known what I didn’t know about Yoga Nidra until I attended this training course! Meg: The content of the course gave an informative background of the historical application of the techniques as well as their modern day applications. I am so grateful I was given knowledge of these practices that have such a rich lineage and history. This was powerful for me to learn about, as it is something I hadn’t experienced in my Western perspective of yoga. It has certainly given me a deeper appreciation for honouring and respecting the specific contexts of yoga traditions, particularly with this specific tradition. The practical components of the course were crucial in allowing the body/mind/spirit to experience the depth and power of the subtle techniques. The combination of practical experience and informative content was a beautiful pairing that continues to fuel my practice and instruction. How do you see yourself being able to use what was imparted on the training? Both personally and professionally? Tracey: Certainly on a personal note I have access to a set of tools that help me. They help me personally to face the challenges of the day, I can see a difference to how I approach challenges, and I am less reactive than I used to be. Of course, this is ongoing and I can recognize the signs when I need to pause, rest, restore. I am still using the Sankalpa formulated on the training and it still helps me today. I integrate aspects of my training into my teaching. Tara: Personally, I now have a regular practice of Yoga Nidra(YN), which has been and will continue to be, extremely beneficial at all levels, and I incorporate some of the Restorative Yoga (RY) practices into my own yoga routine. The Basic Breathing Methods (BBM) are very useful, and I am using these techniques daily. Professionally, I have been teaching aspects of RY plus BBM, to my current yoga clients, as well as YN. I will be incorporating YN and BBM into my corporate mindfulness offerings, and plan to run weekend retreats also. Meg: Personally, I have developed my own personal practice which has been incredible. Prior to this training, I primarily practiced yoga at studios. I felt as if I needed my yoga community to practice, which I still value, yet now have also found devotion to my own home practice. Having the post-residential requirement to keep up with practicing the techniques and reflecting upon the experience of the techniques, I was able to develop my own home practice. For this, I am so grateful, and see myself continuing to use this lifelong tool that was imparted from the training. Professionally, I see myself sharing the practices in my communities moving forward. I have already had the space to teach this summer, both to family and friends, as well as to a broader community here in Minneapolis. It is an honour when I am able to provide space for others to benefit from these practices, and I see it as a deep need in modern day society. What was the process like going from a practitioner to a teacher? Tracey: The transition was very easy and seamless. We were given opportunities to teach one another the practices that helped in our learning but also with how we deliver some of these techniques. The teachers were awesome, very experienced practitioners who live what they teach. We were supported every step of the way and assuming the role of teacher was not daunting at all. Meg: The process going from a practitioner to a teacher felt quite smooth. Perhaps that is because I have prior teaching experience, but I also think it is because of the sufficient training we were given. Although I was sometimes anxious or nervous to teach ahead of time, due to the nature of the practices, I commonly felt a wave of calm come over me once I began the actual instruction. The training was quite thorough and specific, which gave me a healthy dose of confidence to share the techniques with others. I also found that because I had experienced the practices myself at a fairly deep level (both residentially, and also afterwards), I was competent in instructing a class in accordance with the techniques. I find that being a teacher strengthens my personal practice (and of course my own practice is necessary in teaching), as I am inspired by those I teach to be a better teacher. This motivates me to keep practicing and to keep experiencing the power of this tradition. What was the most unexpected part of the training? Tracey: Just how powerful the subtle breathing techniques are. Breathing is something we do all the time and have little awareness. I was amazed at how different I felt after a number of days exploring these techniques. I had more energy and there was a noticeable twinkle in my eyes. I know I have tools that will serve me well in life. Conscious breathing techniques are invaluable. I also realized just how depleted we can get in life, we are over stimulated and our nervous system is wired. It’s essential to take time out and restore. Tara: The profound impact of Yoga Nidra. I had underestimated how deeply this extraordinary practice shifts and loosens things. Everyone needs to know about YN! Meg: The most unexpected part of the training was the intensity I felt once the retreat was over, and the yoga instructor portion had yet to finish. I felt a bit overwhelmed with the content of it all, which I didn’t expect for a yoga course! It was a lot of information to take in, and I found myself feeling a bit stressed by it all. I certainly believe it was worth it in the end, and that it represents the realities we may find in life, being overwhelmed in certain external circumstances, but having the tools to utilize the practice to find a state of balance and calm. How did you feel after completing the full training, including the online learning portion and practice teaching? Did you feel ready to teach afterwards? Tracey: I felt happy with the training and the online portion deepened that confidence over time. I was able to practice and apply my learning and reflect on what I had learnt. I feel the latter part of my training consolidated what we had covered on the course. Tara: Elated to have finished all the components! Also a bit sad that it had come to an end as I had very much enjoyed the whole process and journey of learning these new practices. I loved the combination of both experiential and cognitive learning that took place and personally benefited greatly from the course structure and design. Meg: I did! I found the online learning portion and practice teaching to be a powerful way to continue this training, as it transitioned me into my life outside of Anahata, and allowed me to keep up to date with the practices and with my learning. It held me accountable in this transition, which was very important for me in integrating the practices into my day to day life. I am thankful this was a focus for this teacher training. In my first Vinyasa teacher training, we didn’t have this component of continuing learning/teaching, and I found that transition to be quite challenging in keeping up with my yoga practice, and in maintaining a depth of yogic perspective in my life. The online learning portion and practice teaching gave me the practical experience and confidence to feel ready to teach upon completion. 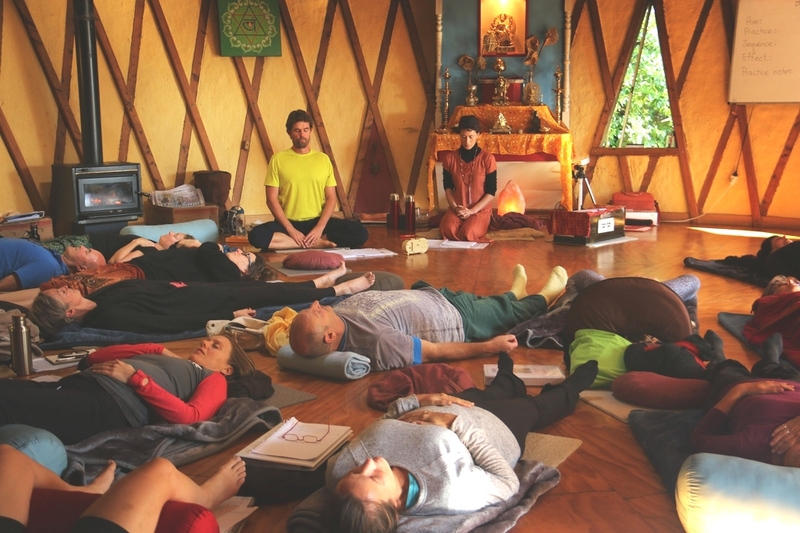 Finally, what would you say to anyone considering Anahata Yoga Retreat’s Yoga Nidra Training? Tracey: It is really amazing to have a period of time to take out for yourself and explore these subtle but powerful practices. You have tools for life that are invaluable for personal transformation and growth. They are essential tools and assist in participating in life more consciously and effectively. I highly recommend the training. Tara: Do it! This is a profound and potentially life-changing course of professional development. You will be stretched and challenged, and your capacity to help others with these wonderful, simple yet profound practices will be enlarged and enhanced. When’s Level 2? Meg: Give yourself this gift! Yoga Nidra is a uniquely powerful yoga practice that is extremely beneficial in today’s day and age. We all need space to experience genuine relaxation, and Anahata’s Yoga Nidra Training is a beautiful opportunity to evoke this experience in your life. It is a gift that keeps on giving, and I have never felt more equipped to respond to life’s realities as I do now. It has given me the tools to create consistency in my life, and I have also been humbled and honoured to share these tools with others as I teach. Anahata in itself is an incredible retreat space; the food is unbelievable nourishing, the surrounding land is beautiful, and people you meet are inspiring in their devotion to their yogic lifestyle. 4 – 22 April 2018 at Anahata Retreat. 28 January – 8 February at Kawai Pura Pura Retreat. A professional development course designed for yoga teachers, health and education professionals. Includes practice, theory, therapeutic applications and the science behind Yoga Nidra, Breathing Methods and Restorative Yoga Practices. This course will equip aspirants and practitioners with skills and techniques for self-support, as well as the tools to assist clients and/or students to dismantle chronic tension patterns, enhance immune function, reduce physical, mental and emotional imbalances and return the body-mind to a natural state of ease and equilibrium. Practices applicable in a variety of fields and therapeutic conditions. Super Early Bird 15% discount ends 18th September 2017 for Yoga Lunchbox readers. Early Bird 10% discount ends 3rd October 2017 for Yoga Lunchbox readers. Mention ‘Early Bird Yoga Lunchbox’ when you make your booking. Tune into this video interview with the lovely Swami Karma Karuna to hear more about: life at Anahata yoga retreat, yoga and women, the Satyananda yoga tradition, and upcoming yoga events. Allow your Self to experience fundamental relaxation and its reconstructing effects on the whole body with a powerful and ancient practice that is highly applicable to the challenges of modern life!